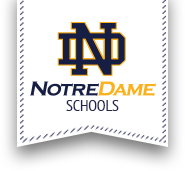 Notre Dame Jr/Sr High School invites new families to visit with our current families, faculty, and staff for a Back-to-School BBQ. The event will be held in the Msgr. Willenburg Center. Free to Notre Dame Jr/Sr High School Families. Please RSVP to Athletic Director, Olivia Tooley at otooley@syrdiocese.org by August 24.